Super Eagles coach Gernot Rohr has vowed to field Kaizer Chiefs glovesman Daniel Akpeyi in Tuesday afternoon's high profile international friendly against Egypt at the Stephen Keshi Stadium. The German pointed out that he kept faith with the goalkeeper despite plenty of Super Eagles fans calling for his head in the wake of the national team's 2-0 loss to South Africa in their Africa Cup of Nations qualifiers opener in June 2017. Although Akpeyi always receives invitations to the Super Eagles, the former Warri Wolves star has featured in only five games from a possible 25 since the appointment of Rohr as coach. Speaking pitch-side after the Super Eagles 3-1 win vs Seychelles, Rohr told reporters : "You know Daniel Akpeyi is in the team all the time, even after the first match we lost in Uyo against South Africa where everybody criticized him. 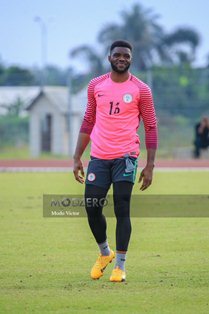 It is confirmed that Akpeyi will make the match day 18 vs Egypt as first-choice goalkeeper Francis Uzoho has been drafted into the Olympic Team ahead of an U23 AFCONQ vs Libya.